A dryer sheet works to disperse static cling by coating fabrics with chemicals transferred from the sheet by the heat of the dryer. These same chemicals that are in high concentrations on the dryer sheets can harm your pet; especially if they chew or ingest a sheet, even a used one. Formulas vary from product to product, but your favorite fabric softener or dryer sheet may contain benzyl acetate, camphor or even chloroform. None of this is good for pets. 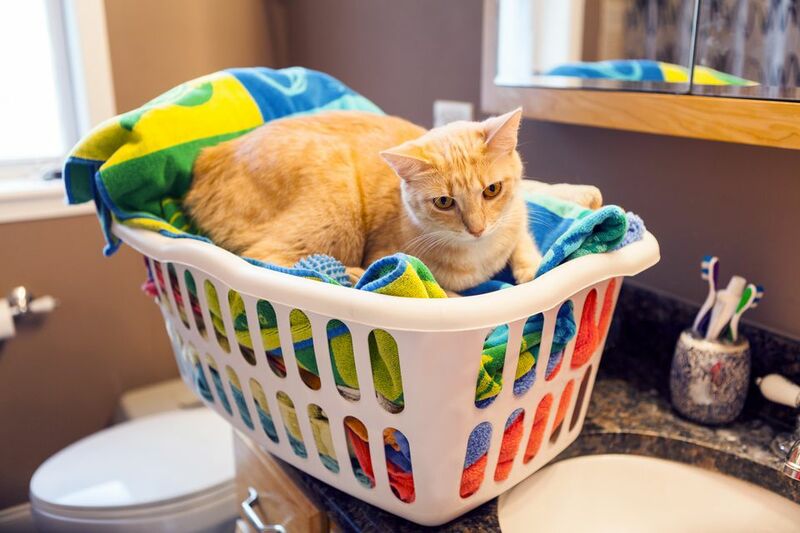 The Merck Veterinary Manual warns that cationic detergents, which are present in fabric softeners and dryer sheets, can cause a variety of problems for animals ranging from minor skin irritation to widespread systemic distress and pulmonary edema. Kidney failure is also one of the problems that can occur after ingestion of dryer sheet chemicals. Most dryer sheets are made from non-woven synthetic materials that do not biodegrade easily. If your dog or cat, especially small or young pets, ingests these sheets, stomach and intestinal blockages can occur. As any pet owner knows, these blockages can require expensive surgery and even be deadly. With many laundry rooms used for pet feeding or care, dryer sheets should never be stored where an animal can ingest them or play with them. If your pet has ingested chemicals from a dryer sheet or swallowed the whole thing, contact your veterinarian immediately. There is a well-meaning but dangerous tip on the internet about using dryer sheets to remove loose hair from cats or dogs and to reduce natural static when the humidity is low. But animals lick their fur and will ingest the chemicals so using dryer sheets to remove fur is dangerous. Dryer sheets are, however, good for removing pet hair from our clothes and upholstery. Just don't use them on your pet's bedding. Look for sheets that use plant-based ingredients. Skip the liquid fabric softener and dryer sheets when you wash pet bedding or pet clothes to keep your best friend safe and healthy. Liquid fabric softeners contain the same harmful chemicals as dryer sheets. As a pet lover, you may allow your animals the run of the laundry room. With warmth-producing machines and plenty of things to chew on, it may seem like a great big playland to your pet. Unless you are able to supervise your pet in the laundry room at all times, the laundry door or access to the machines should be always be closed and all products safely stored behind closed doors. To an animal, a washer or dryer may seem like a great place to take a nap - especially if the machines are nice and warm. Always keep appliance lids and doors closed to prevent accidents. For maximum safety, unplug washers and dryers when not in use. Always take time to check that the machines are empty before you add clothes and turn them on. In addition to dryer sheets, all laundry products should be stored in a locked or pet-proof cabinet. Bleach, stain removers, and detergent can be toxic if consumed. Always sweep or wipe up any products that spill onto the machines or the floor. Liquid capsules or soft packs of detergent are particularly dangerous because they look like a toy or bite-sized treat. If they are punctured, the product often squirts into the eyes of pets and can cause corneal burns. Consult a veterinarian immediately if the single-dose detergents are swallowed. Some chemicals, like chlorine bleach and ammonia, form harmful toxic fumes when combined even if the animal does not consume the products. Never leave anything within reach where it could be spilled. Ironing should not be done when a pet is close by. Just one bump to the ironing board can bring a heavy, hot appliance down on an animal. Never leave a hot iron sitting on an ironing board unattended. Even a cold iron is dangerous if left plugged in at all times. A cordless iron with automatic cut-off is an excellent choice. The safest ironing board is a built-in wall ironing board with a locking cabinet. Are You Using Your Clothes Dryer Correctly?